A screen shot from the most popular Iranian soap opera, entitled "Zero Degree Turn," which centers on a love story between an Iranian-Palestinian Muslim man and a French Jewish woman. Please see below for more on this show. I hope you are all well. Here in St. Louis we are enjoying the slight cooling down of September while Washington University is now in full motion with the fall semester. New students, some new colleagues, lots of activity…it is all wonderful. I am off for a short trip to London to convene a conference/celebration of the 800th birthday of the great medieval poet and mystic Jalal al-Din Rumi. You can read about the conference at http://www.iranheritage.org/rumiconference/programme.htm. The conference will bring together quite a few world scholars of Rumi. Let us open window number 39 on Iran before I leave for London. friend returning from Iran brought me four randomly picked magazines. between an Iranian-Palestinian Muslim man and a French Jewish woman. ode to getting lost in love — is a hit, too. Iran: http://online.wsj.com/article/SB118912609718220156.html?mod=loomia&loomia_si=1 (also, click on the video below to see the first episode!). All right, I dedicate this window to the Jews of Iran with this short and beautiful slide show of the wedding of Sanaz and Payman, two young Iranian Jews who got married three weeks ago in a beautiful synagogue in Tehran. 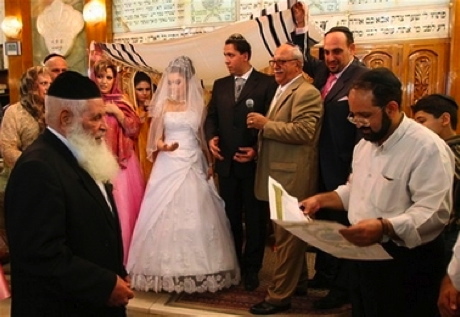 Please click here: Jewish Wedding in Tehran. Jewish wedding in a Tehran synagogue (click the link above for more pictures from Sanaz and Payman's wedding). 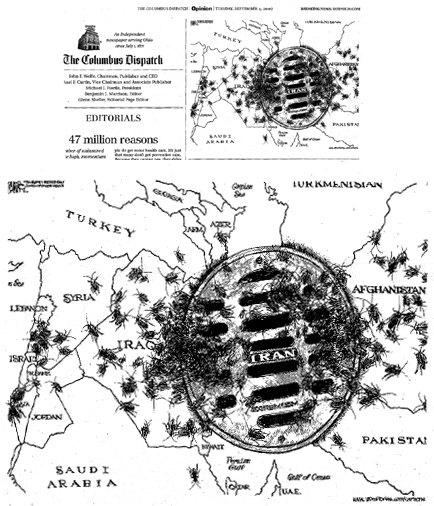 * On September 4, the Columbus Dispatch carried a cartoon that depicted the entire map of Iran as a sewer with cockroaches running out of it and infesting neighboring countries (see the cartoon I only reluctantly insert below): http://www.payvand.com/news/07/sep/Racist-Iran-cartoon-Columbus-Dispatch.jpg. I wrote to the editor, asked if he realized the implications of turning 70 million people into cockroaches, and indicated that I was amazed – indeed speechless – that this kind of Nazi style dehumanization propaganda could be carried out by a respectable paper. The editor wrote back – referred to Mr. Ahmadinejads anti-Semitism – and suggested that the intention was only to caricature the extremists! Since he sounded very nice, I mailed him the beautiful wedding pictures of the newly wed Jewish couple Sanaz and Payman in case the paper would like to show Americans a dimension of Iran that most Americans do not see. I have not heard back yet. Racist and dehumanizing Columbus dispatch cartoon depicting Iranians as cockroaches. Mahtab Abdullahi (or, Mahtab Abdollahi). 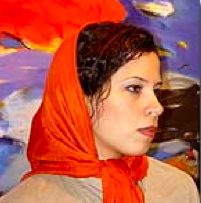 Now, to replace dry political discussion with a bit of fun and introduce a healing note, I would like to invite you to meet a very young Iranian painter: Mahtab Abdullahi who seems to enjoy playing with orange and blue in particular. Please click here: Mahtab Abdullahi Painting Show.